After Kolar, I am gearing up to cover the Tumkur district. 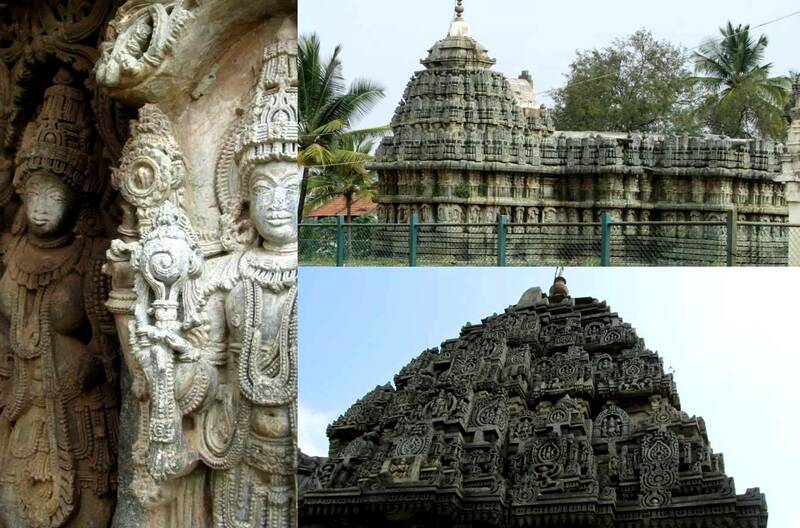 Having traveled to Kunnigal and Sira taluk, I browsed through the map to find my next location and was surprised to find almost 10-12 Hoysala temples in this quite taluk of Tumkur, called Turuvekere. Traveling with a purpose, with an intention to know different people, their culture, the history of the place, the present and the help they may need has always been my style of traveling. So in a way this trip opened my eyes to some truth, some realizations and some ruins that we can otherwise support. Turuvekere was once called 'Dhenupuri'-(a city of cows) and was once an “Agrahara' or ‘Rent-Free Village' granted to scholarly Brahmins in the 13th century A.D.
My wife P, Cousin N and I left on this expedition early on a Sunday morning (Jan 2nd), on my i10. We took the Hassan route till Yediyur and then a right deviation to Turuvekere. This is the best route and coming via Tumkur may end up longer. As soon as we arrived at the town, I stopped by a sugarcane juice vendor in order to convert the list of temples I had researched into a driving destination with routes and directions. He was extremely helpful and not just told us the route but also gave the order of visit we should follow which turned out to be very helpful. Our first stop was Channakeshavatemple. 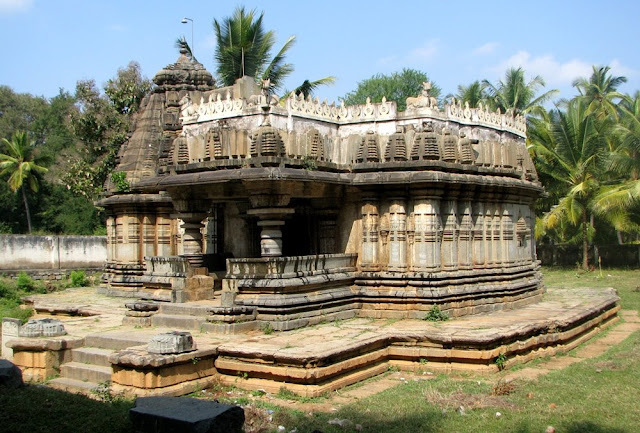 Passing through Narrow Streets, standing alone is Channakeshava temple built in 13th century in usual star shaped foundation. The priest arrived in no time and opened the temple for us. He performed pooja and archane. The priest has worked as a chemist in cement commissioning industry before. When he resigned the job to fly to gulf, the war broke out there and – “I remained back here.” He said. “Finally you have the profession that your ancestors have been committed to, I followed their step.” He added gracefully. He also expressed the fact that there was no much funding to the temple and his father and he had cleaned it themselves. Many villagers have other new temples that take all the attention. Since they did not want to leave the idol un-attended, they perform pooja every day. He also guided us to other temples in the vicinity. Turuvekere city has three more temples of this time to see in walk able distance from one another. Moole Shankareshwara is a beautiful temple which was excavated by archeology department few years back to notice the star shaped foundation typical in Hoysala architecture. 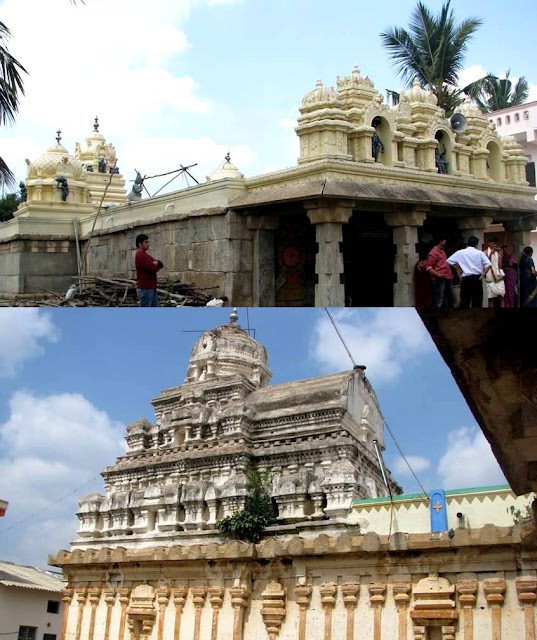 Some of the rocks carry the signature from the main architect – Jakana achari. Temple- Gangadhareshwara was unfortunately closed so we could only view the architecture and sculptures from the outside. A sculpture on Bedara Kannapa and a huge bell made of rock is an attraction here along with a huge Nandi. 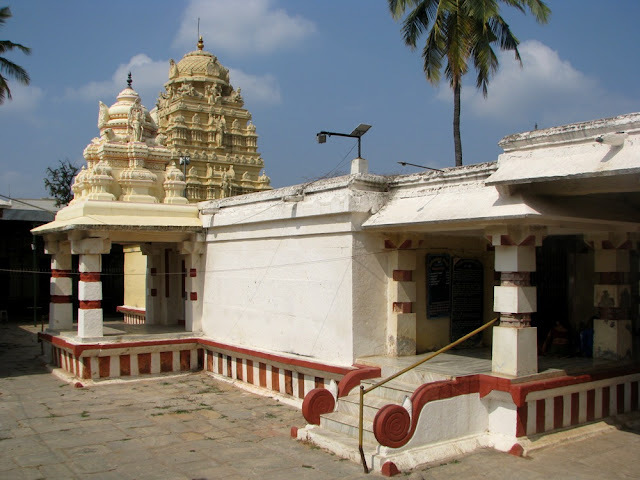 Another famous temple around the corner is Lakshmi Beteraya Temple- a Vishnu temple seems to be very famous and with better funding than others. 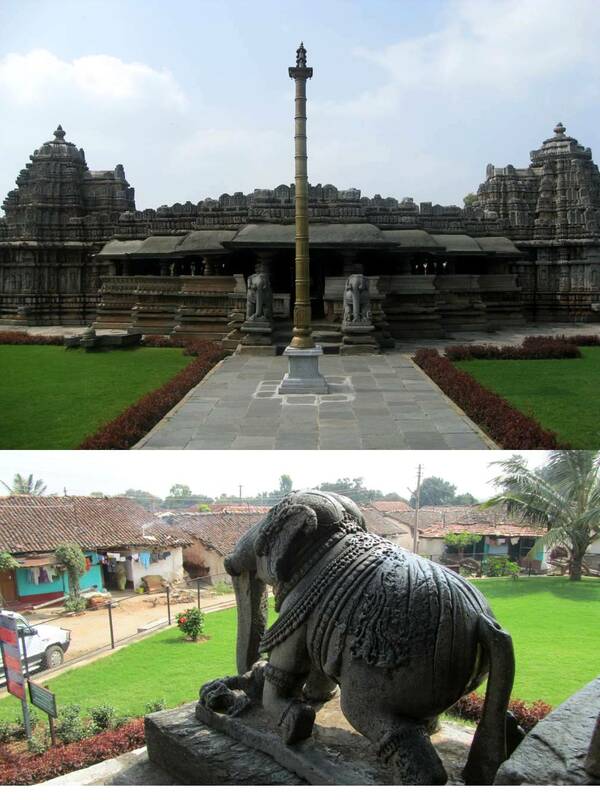 It was built by built by Mahadandanayaka Somanna. We next drove to Nonavinakere which is a left deviation on the way to Tiptur (around 6-10 kms away from Turuvekere). A quite village houses two more temples - Sri.Venugopala Temple & Sri.Beteraya Temple, both Vishnu temples, popular among iyengars. While the first remained closed with a window open to view the God, second was opened by a very old priest for public view. He was very old and was finding it hard to walk around which also brings to light the losing interest in the traditional professions among younger generation. One of an honest reader of my blog, mentioned to me other day that my writing is going through, what he believes, is a transition in my nature. They are becoming less descriptive and more surface level treatment of incidents and it seems to be losing those characterizations which he believes, was prominent earlier. Can’t agree any less with him. Just when I was beginning to think in similar lines, I had this very timely feedback from a friend. I know that it is true and I know that I have been deviating into way too many things. But a trip to Turuvekere and Lepakshi has brought back in me, those natures of extreme fondness to observe and know people and their culture. Before I write about these trips, I have some more information’s to cover in this post. My principles have always kept me away from competitions and hence I even backed off from being a contestant in midnight marathon for some other excited friends. The sheer joy of having company to jog was all I anticipated in the practice sessions and fun run at the marathon. With the marathon time gone, many lost interest in continuing the jog. But some of us, who thought that continuing this, would be a good way to keep fit and easier with likeminded people, have made this a regular. So we have started what we call as “the joggers club”. We leave office 15 minutes earlier than the time and jog around 2.5 Kms and board our respective cabs on the way. Three of us have also started to bicycle our way to office (40KM). We take the Kanakpura route to Harohalli and then to Bidadi. 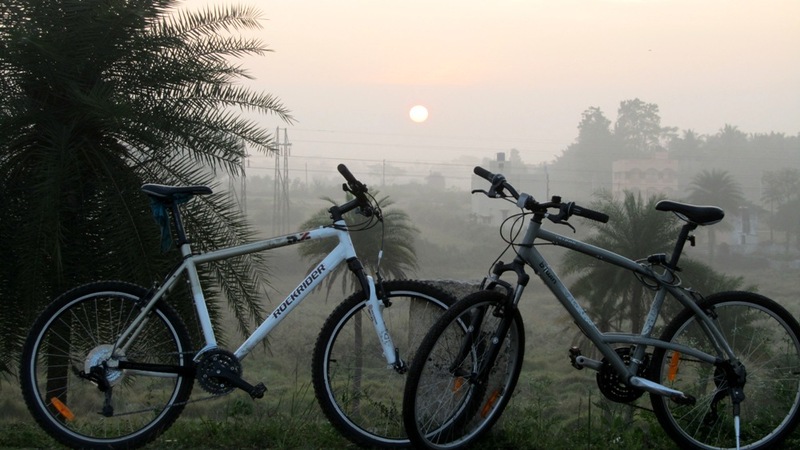 The ride begins at around 5:10 AM from our home with a traffic less ride on Kanakpura road watching the initial rays of dawn, the sunrise, stopping for a cup of tea with a piece of cake and beautiful serene village life. The road that connects the Kanakpura road to Bidadi passes through small villages with streets covered with Raagi harvest left for wheels to separate the seeds, lazy dogs stretching their legs, curious villagers where men are just waking up and women have already began their cleaning or cooking activities and kids are getting ready with their school uniforms. While returning back it is a whole new scene all together. The villagers are still busy with their work, the kids are returning home from their schools and race with us at times or happily wave at us or at least mention - “gear cycle!” with all the excitement. A stop for few tender coconuts and another for some hot tasty Maggie brings us to busy city premises packed with frustrated people either on an automobile or by foot, returning from a tiring day and are always in a hurry. Well if that is about the physical fitness, our office cab has a collection of artists now. Three of us sketch/ paint, so it’s always fun to discuss with likeminded people about their style, their resources and their preference in art. Each one of us have a distinct style in art. So the drive to office is filled with knowledge sharing. 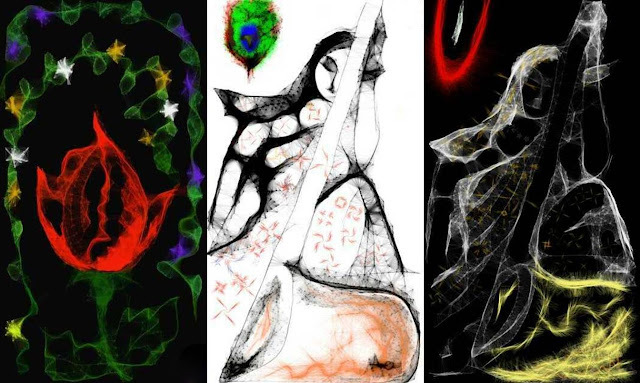 Thanks to them, I have been introduced to the software called – Magic brush and these are paintings from the software application on a cell phone, done using a stylus. Over these interactions and happenings, I have realized one thing that for someone like me with varied interests, there are many people around whom we meet and who have some of my hobbies in common and it may be impossible and improper to look for only one such individual. World is filled with wonderful people and everyone is gifted in their own way! And some of those common cords connect through friendship. For a friend’s wedding four of us from office decided to visit Manipal. Around it, we planned a 3 day trip that would take us to few more places on the way. Subbu, G, S and I left Bangalore on the 18th of December on my i10 to Javagal first (Via Tumkur; maps through Google map). On the way I almost hit a dog but luckily it escaped being tagging me as a murderer. Rest of the way till the trip ended all the dogs bothered our drive by either barking at us or threatening to jump in front of the car. In our quest of a short cut we took several U-turns and wrong directions and finally reached Javagal where a small Hoysala temple of Lord Lakshmi Naasimha, rests in semi ruin. The temple was closed so we only got a glimpse from outside. From here we drove to Belavadi another magnificent Hosalya work of art. 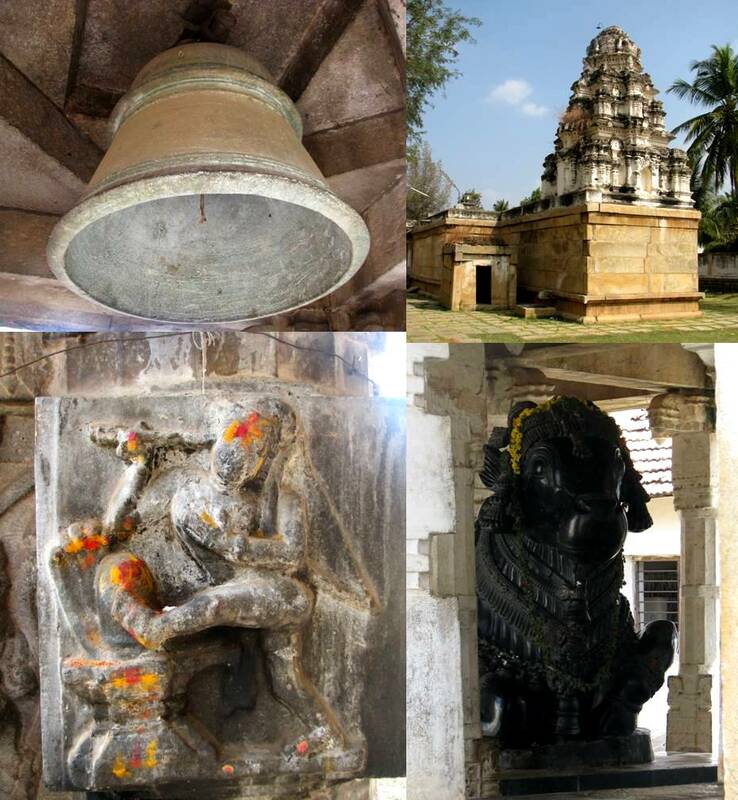 At the temple made of soap stone pillars beautifully carved are three idols – Veera Narayana, Venugopala and Yoga Narasimha. The temple priest was nice enough to explain the importance of the place. He informed us that on a particular day, the light from the morning sun enters directly to the main shrine. There are very few tourists here so the little time we spent here was very peaceful. 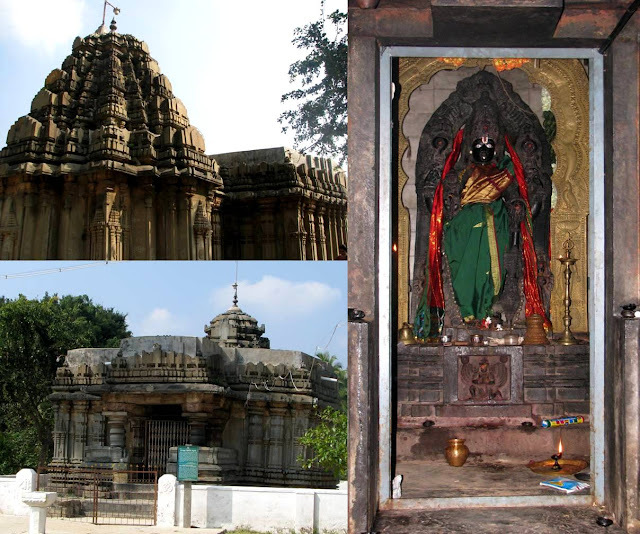 By afternoon we reached Chikamagalur and stopped at Hiremagalur Kodandarama Temple but it was closed. From a friend at office we got to know a hotel for lunch – Soundary paradise at chikamagalur. After some search and more U turns we finally had to settle with Soundarya Residency. The food was good. The drive after Chikamagalur was fantastic through Charmadi ghat. The roads here are far better than shiradi and are free from heavy trucks and buses. We reached Ujire by 7:00 PM. Checked into a hotel and after a bad dinner crashed on to bed. In the morning we got up early and got ready by 7:00 AM and drove to GadaiKalu or Jamalabad fort base which is 8km from Belthangadi town and is 1788 ft above sea level. 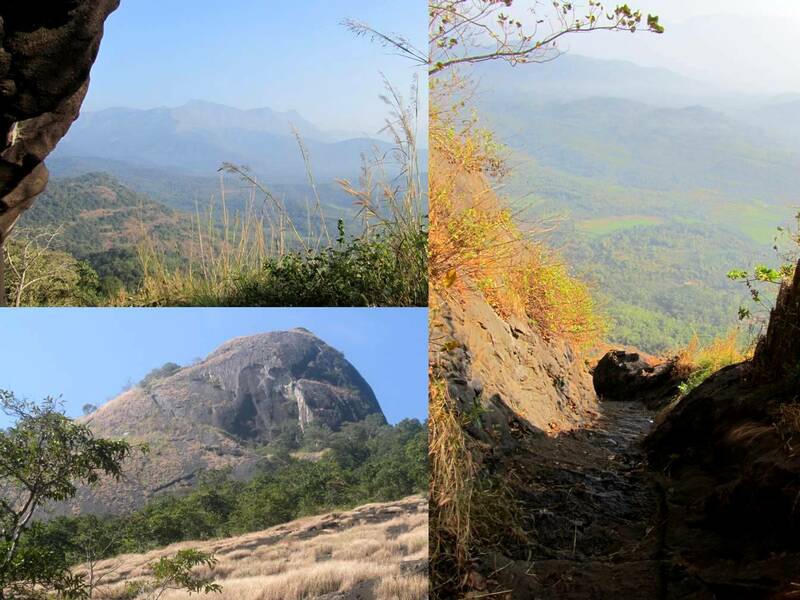 Beautiful view of Kudremukh mountain range and high steps made the trek both interesting and challenging. The view from the top was very interesting and after a short nap at the top we returned back. At base now, we had a forest guard who charges a fee for the trek that I realized was some extra money to his pocket as the receipt book he had, had no leaflets. He was informative on suggesting some other trekking spots around the area. We planned to drive to the Kambla happening there nearby but villagers told us that the event has ended already, so we returned back to the hotel, got ready and left to a temple in Suria, a place near Ujire but mistaken by us as Surya (Sun) temple. The temple has a special thing about it. People make a wish and if it is full-filled they make a mud idol of the wish and offer it to the God. We returned after a short stay; drove to Mangalore. Had lunch at Palkhe and walked to my College – St. Aloysius College. We went to the chapel. 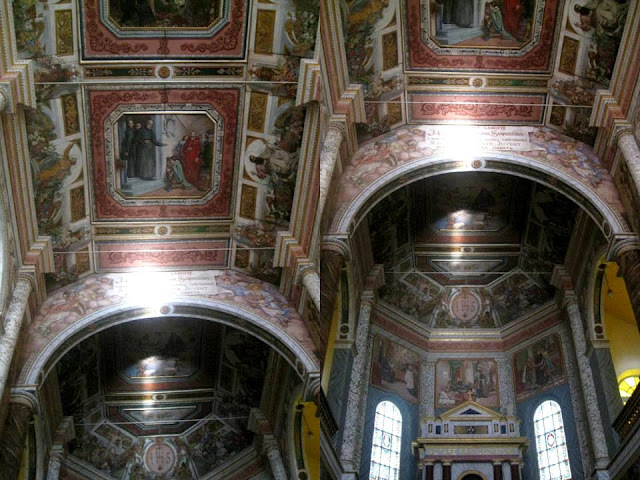 The chapel was built in late 19th century and all the interior walls are painted. I was here after a long time, the last being while in college (1998). Our next stop was Pabbas for some cool ice-creams and then to Suratkal, my house. We walked to the beach and relaxed there for a while before returning home for dinner. Next morning, I drove to few nearby temples with Appa and Amma. After breakfast (Neer dosa and Pathrode) we drove to Udupi temple and then to Manipal for the wedding. On our return journey we took the Agumbe-Shimoga route. The hair pin bends at Agumbe was very exciting. We stopped at the sunset point at afternoon and trekked a small distance to Jogagundi falls. A small Kamat hotel on the way was a nice place for some fresh and good Golibaje, Mangalore buns and neer dosa. It was non-stop driving from here to Shimoga and then to Tumkur. After dinner at Kamat again, we returned back home. All together it was a great trip with lot of places visited, several things learnt, on various aspect. It was a trip that involved all the explorations of a good travel and with some redefine in perspective not just with the nature but with people around.